A new report by the market research and strategy consulting firm, Global Market Insights, Inc, shows that the market for automotive 3D printing, propelled by government and industry initiatives, could surpass $8 billion by 2024. Several countries have developed national programs to support university level research. For instance, the Canadian government launched the Industrial Research Assistance Program (IRAP) to drive use of 3D printing among small- and medium-sized organizations. Also contributing to the rise in automotive 3D printing: increasing customer demand for innovations and lower prices across customized products. The report singles out one 3D printing technology—electron beam melting (EBM), forecasting a compound annual growth rate (CAGR) of more than 28 percent for the technology, which utilizes high-power electron lasers to melt and fuse metal-alloy powders used for fabricated parts. 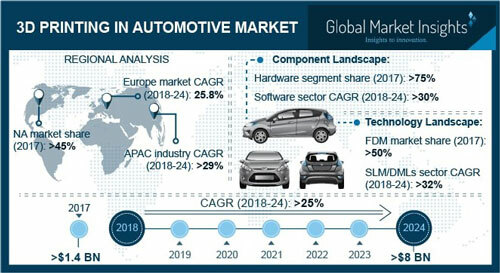 The fast-growing Asia Pacific automotive 3D printing market, with an anticipated growth rate of more than 29 percent over the forecast period is driven by the increasing public and private investments. To learn more about 3D printing and what it can do for your company, make plans now to attend the 3D Metal Printing Experience and Tech Tour, Aug. 6-7 in Detroit, MI.